Instead of doing a HUGE post about Mod Podge, I’ve decided to break it up into several posts for easier reading. Here is the first post, the rest will be coming every few days. Again I didn’t mean to be absent from the blog for a couple weeks. Our journey in moving house has taken longer than I thought! My computer and quilling desks are still hiding underneath boxes! But I am sitting in the dining room with the laptop, determined to start getting these mod podge posts going! There are SO many great products out there that can be used to make your paper quilled jewelry sturdy and water resistant. One of the products that is most easily available worldwide is Mod Podge. Mod Podge comes in many different formulations. There are many sites out there that have craft projects using Mod Podge, and at least one blog that focuses on ALL things mod podge. On that site you can check out this page to see what some of the finishes look like after they dry. There is not much out there about how to use Mod Podge with paper quilling, though, so that’s what these posts are all about! 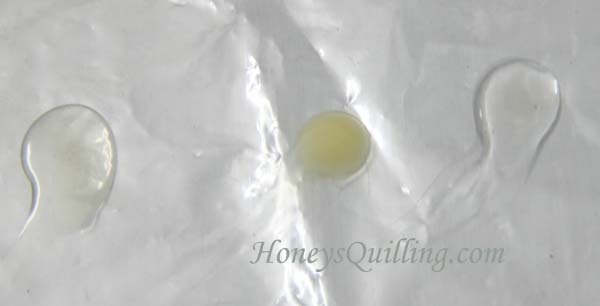 I spent about 2 weeks using my different mod podge formulas on different types of quilling to let you know what works best where, and how to use it to get the best results. There is more to learn and more things to experiment with, but this is a good start! First of all, this is the exact set of Mod Podge that I bought, and I bought it from Amazon . I thought this was much better than buying a big bottle of just one or two types. It allows me to try several and see what works best. This set came with original matte, original gloss, paper matte, outdoor, and sparkle. For the purpose of this particular post I have used original matte, paper matte, original gloss, and sparkle. I read that the outdoor is great for protecting more against the elements, so maybe that would also be a good fit for jewelry, but I figured it wouldn’t really look much different, so I haven’t tried for my first run. I only used sparkle on some of the trials as that one is more for the looks. So for the majority of the trials in these posts I have used original matte, paper matte, and original gloss. I read on this page that the paper Mod Podge is particularly for scrapbooking where you want the glue to be archival. That means that it won’t harm photos, won’t yellow the paper after a long time, etc. Sounds like something that would be good for paper quilled jewelry as well, as you want it to last as long as possible! On the other hand, I was kind of surprised that the finish for the paper matte is kind of opaque. You’ll see how in the photos below. My very first thought when I opened the bottles were that it was smelly! It is quite a strong glue smell. It is non toxic, so not really “fumey”, but it still has quite a potent gluey smell. I’m used to working with PPA which really hardly smells at all. Besides the smell, I noticed that all of the formulations were bright white except for the paper matte. That one has a antique sort of tinge to it – like a very light tan color. All of the formulations are quite thick. It is thicker than normal paper craft glue, but not as thick as tacky glue. When you paint it on, it will show the paintbrush marks. I read on this page that you can use a very soft brush and then sand it after each layer dries (the page tells what to use for sanding) to make sure it is smooth before applying the next layer. It is not as easy to get nice and smooth as other topcoats I have used. 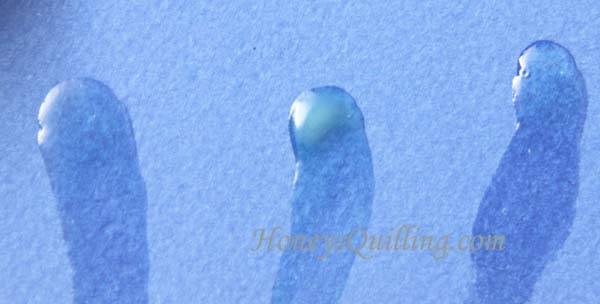 With PPA, for example, you can see the brush marks at first but they will smooth out before it dries, because it is more liquidy (unless your PPA is a bit too dry, then the brushmarks will remain even after drying – you can see more about this on this post I wrote about PPA as a sealant). Of course, you can’t really use sandpaper on your paper quilled jewelry, unless you are making a simple solid circle design. So that is not a very useful tip for quilled jewelry. The bottles say to put several thin layers on your project. I experimented with just one thicker layer to see if that would avoid brushmarks. It did, but it created a different issue. Because the Mod Podge is quite thick, it will basically stay where you put it. It is hard to get a very even layer, even when just dabbing on a thicker layer and not really brushing it on. So you’ll get an uneven finish (you’ll see that in the photos below). Maybe it just takes some practice. But other products that I use such as PPA, Diamond Glaze, Crystal Coat Glaze, and more all kind of even out into a flat layer because they are thin enough to do that. I guess I would say that Mod Podge is more dimensional. So, today I will be focusing on the different finishes and what they look like, but not yet on paper quilling. You’ll see three different paper quilling applications in the coming posts. Today is just on paper. All photos are taken after the mod podge is completely dry. Here are the different mod podge finishes that I used, put on white paper. I dabbed a blob on the paper and then smeared it with a finger so that I could see what both a thicker layer and a thinner layer would look like. From left to right you see the regular matte, paper matte, regular glossy, and sparkle. You can see here how opaque the paper matte is. It has a yellow/tan hue to it as well. I’m not really sure why, I find it kind of strange. Luckily you only see that in the thick part. In the “tail” where I smeared the mod podge into a thin layer you cannot see as much of a yellowish hue. Here you can see the matte, paper matte, and glossy all on a plastic bag surface. You can see how perfectly clear the matte and glossy are, and again how opaque the paper matte is. I wanted to see how they would each look on a colored surface, so I used both a light green and a darker blue gift tag to test. You’ll notice that the opaqueness of the paper matte is not quite as noticeable on colored paper. You can also notice that the mod podge does darken the color of the paper – moreso with the blue than the green. This effect varies depending on the particular paper. On some quilling papers you’ll notice the darkening while on others you won’t. Honestly I don’t mind this, it’s just an effect that most sealants have. Since you are sealing the entire piece you don’t notice it once it is finished. Mod Podge is a convenient sealant that is available in most places around the world. It has a water resistant finish that can help you make more sturdy quilled jewelry. The different finishes can be used to get the effect you want. The glossy finish is very glossy, while the matte is a bit less. It is not actually a “true” matte. I guess I am more used to matte PPA which is a *complete* matte finish, not shiny at all. Mod Podge matte still has a little shine. But less shine than the glossy of course. I find that the finish is fairly soft, not a really hard finish. But that is pretty typical of most water based sealants (I find this to be true also of PPA, crystal coat glaze, etc. though it does seem to be even a tiny bit softer with the Mod Podge). It can have a *slight* tacky feel even when it is completely dry. On the bottle it says to cover it with an acrylic glaze if this is an issue. Some other sealants also have this issue. It isn’t a problem unless you stack your quilled jewelry for long periods of time. Then the tackiness *could* cause them to stick together a bit, sometimes ruining the finish a bit. But if you hang your quilled jewelry then this will not be an issue at all. In the next few posts you will see Mod Podge being used on solid quilled designs, moderately tight quilled designs, and looser quilled designs (all for jewelry). Hopefully all of these posts will help you decide whether Mod Podge will work for you and which finish you would like to try. If you have any particular questions about Mod Podge, feel free to ask and I’ll do my best to answer! *All products and supplies in this post I purchased on my own. Hello mam, i am new to making quilling jewelry. Should i apply mod podge as finish coat to make earrings water resistance. I don’t want to give and shine. So i am not getting PPA here.what else i can try for my quilling earring to make it durable, water resistance/water proof. I am looking to sell my earrings. Yes, you can use mod podge to protect your quilled earrings. I think PPA is a bit better than mod podge, but mod podge works fine as well. How about using diamond glaze instead of mod podge? Yes, Diamond Glaze is great, it is one of my favorites. I have mentioned it in several posts but haven’t done a post JUST about diamond glaze yet. I definitely recommend it. Thank u Honey! Thanks for being so kind and sharing ur ideas thoughts and experiences thats helping others. Love ur blog! Good to know! I was looking for info on whether mod podge could be mixed with water, but I couldn’t find any and haven’t tried it yet. Thanks for your input! May i know should i apply varnish after applying the modpodge to make the earring waterproof? I think modpodge is not waterproof……. Hi 🙂 Mod Podge is water based, so it so not truly waterproof, but it is water resistant. This is true for most of the topcoats, sealants, and glazes you’ll find. They will be fine if they get some rain on them, or if they fall into some water, as long as they are dabbed dry and laid out to fully dry if necessary. But if they go through the washing machine they are not going to be in excellent shape (though I have salvaged a couple paper quilled rings that have gone through the washer. Anyway, water resistant is usually good enough. If you want to be totally waterproof, like you could wear it while swimming, then you’ll have to use a resin coating. There are some acrylic sprays and varnishes that will also give you a waterproof coating, but it can be difficult to coat your piece perfectly. It’s up to you whether you want to make that extra step or not. i m using modpodge its good to use but i feel like sticky..
how much time does it take to dry completly.. I made a sindur box with quilling i used modpodge here, when i close the lid , it was sticking to the other pieces some what difficult to open.. what to doo?? Unfortunately mod podge can have that slight sticky feel even when fully dry, especially in a humid climate. On another mod podge blog it suggests to spray your final piece with an acrylic spray sealer if this happens, to give a non sticky finish.